Looking at the stories of Abraham, Isaac, and beyond, this commentary of the latter half of Genesis is an insightful new look at Israel's origins. Want to know how God's word can speak to you? Genesis sets the scene for the whole of the Bible, and indeed the entire human drama. It is a book both of beginnings and of a new beginning - the dawn of the gospel. Joyce Baldwin shows the vivid narratives of Abraham, Isaac, Jacob and Joseph speaking to us today, despite their great antiquity. Above all, they highlight God's ways of dealing with ordinary men and women. God takes the initiative in drawing us to himself. His purpose is not local, but world-wide; the rich scope of God's love is tellingly evident. Yet, in fulfilling his great plan in history, he works individually - with people who are fearful like Abraham or twisty like Jacob. Their often painful experiences enabled them (and help us) to know the specific character of the God they worshipped. The narratives, Joyce Baldwin points out, are an epitome of the gospel. 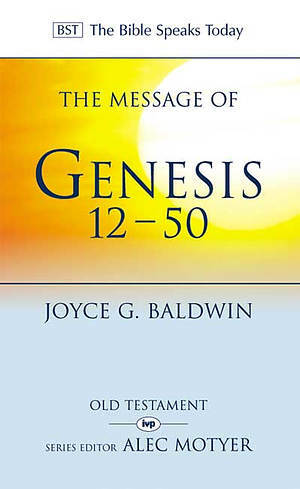 The Message of Genesis 12-50 by J.G. Baldwin was published by Intervarsity Press in July 1986 and is our 14174th best seller. The ISBN for The Message of Genesis 12-50 is 9780851107592. Be the first to review The Message of Genesis 12-50! Got a question? No problem! Just click here to ask us about The Message of Genesis 12-50.